You want to bring in new mobile searchers the right way: by providing useful content that matches their search queries. When you include lots of popular search terms just for the sake of including them, you are stuffing keywords into your content. Repeating keywords results in content that is awkward for your guests to read and is considered a black hat tactic because it doesn’t add actual value to your page. On the contrary, keyword stuffing only attempts to trick search engines into serving up your site to more users. Google rewards natural-sounding content and punishes too much keyword repetition. A good rule of thumb is to use one keyword for about every 100 to 150 words of content. Some people try to fool Google by incorporating popular terms into their content that do not directly relate to the general theme of the page. This is a sophomoric grab for extra Web hits. For example, say the focus of your site is custom car overhauls. Adding words that are popular search terms on Google such as “Donald Trump,” “cat videos,” and “Indy 500” will generate more search engine results for your page. However, this will only be a short-term boon. Google will quickly discover your ploy and your ranking will suffer accordingly. Stick with legitimate, quality content. Google always rewards quality. Be original. That is to say, keep repeated and borrowed content to a minimum. Build a responsive website that transitionsnaturally to different devices instead of creating a separate mobile site that displays the same information. At the very least, your desktop and mobile websites should point to the same URL; otherwise, you may be penalized for duplicate content.Google discourages the reuse of content across multiple sites, so it’s best to create a single, mobile-responsive website. Never paste the exact same text across multiple pages, even if you own the content and have the right to redistribute it. The same holds true for using content from sites other than your own. It is OK to quote; just do it sparingly and always cite your source. When in doubt, paraphrase so that Google recognizes it as original content. Providing valuable links is a good way to increase SEO on your mobile site, but link stuffing is considered among the worst black hat techniques in SEO. Inbound links are a critical variable for Google’s ranking formula—provided they are natural. Don’t post irrelevant links, purchased links, or become a part of a link farm. Link farms consist of sites or pages that exist just to link to each other, or may contain link directories with irrelevant URLs. As long as the links you include lead to relevant content on a quality website, you can maintain strong mobile SEO. Having text that search engines can see but your readers cannot is highly frowned upon. Hidden text is a black hat SEO technique that relates closely to keyword stuffing. For example, adding extra or irrelevant keywords in white text on a white background will attract Google’s spiders. However, your site will soon feel the wrath as search engines catch on to your ploy. You may enjoy a quick spike in traffic, but your ranking will be reduced in due time. Build your site the right way. Provide quality content. Don’t trick your guests or the search engines. The only time that you should incorporate any text that the viewers can’t see is in image tags and titles. Even then, use legitimate keywords that directly relate to your content. 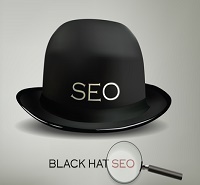 When you are building your webpage, you should never be left asking, “What is black hat SEO?” It’s vital to learn the basics so you can keep attracting visitors the right way. Protect your Google ranking and your website’s reputation by sticking to white hat SEO and avoiding common pitfalls that lead to search engine penalties. Write quality content that integrates keywords naturally, don’t post spam links, and optimize your images with appropriate names. Also, avoid scams that claim to build your site for you; they don’t have your best interests in mind. Instead, they specialize in black hat practices like the ones mentioned above. If you use Google-approved SEO tactics, your site can gain new traffic in no time.